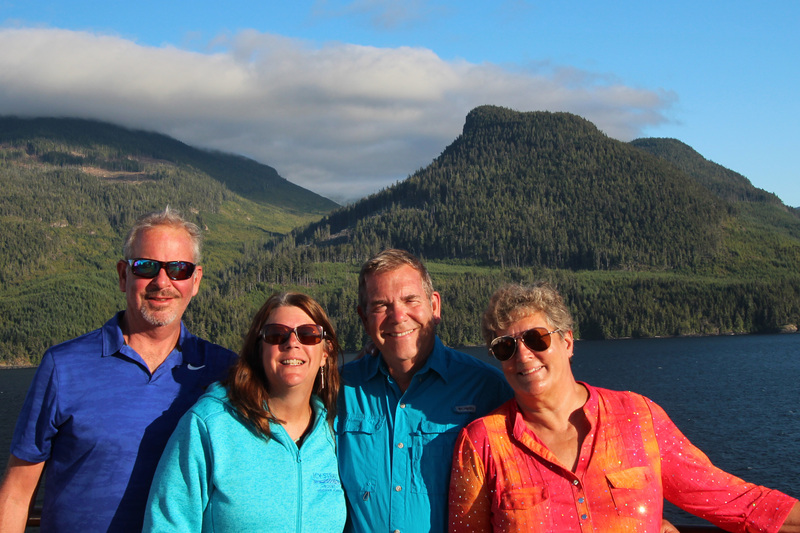 The great Alaskan adventure continues for the four explorers: Doug, Jackie, Jeff and Vicki. 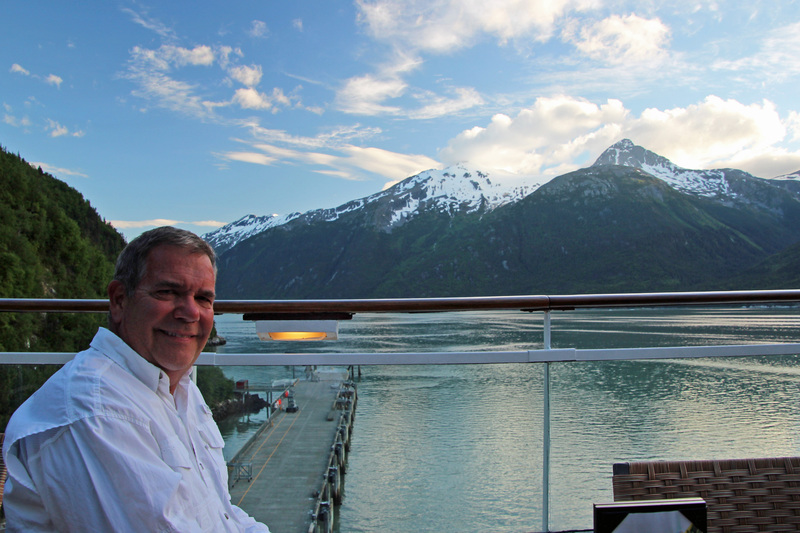 This June trip-of-a-lifetime had a great start in Anchorage and Seward, Alaska and continues south through the Inside Passage aboard the cruise ship Celebrity Millennium. 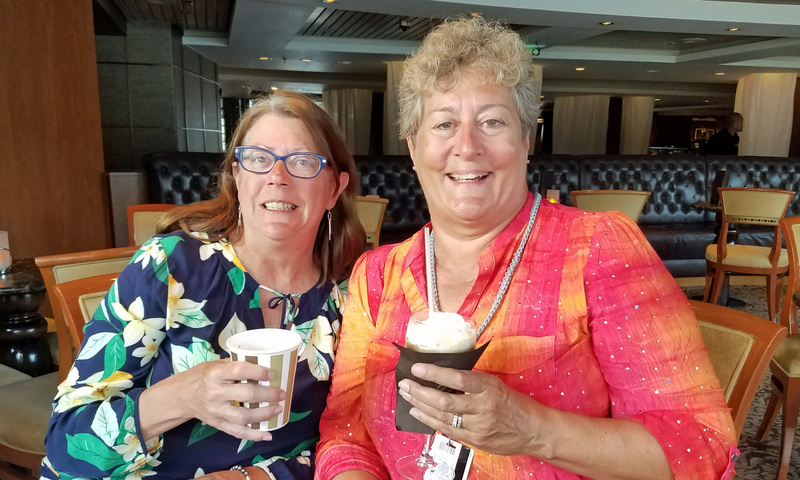 This was our first time aboard a Celebrity ship and we were well impressed. The food and service were just wonderful, our oceanview staterooms were generous and the vibe onboard was relaxed and comfortable. Blankets on the upper decks were handy on chilly, wet days and the pools and hot tubs were refreshing on a couple of rather warm sea days. 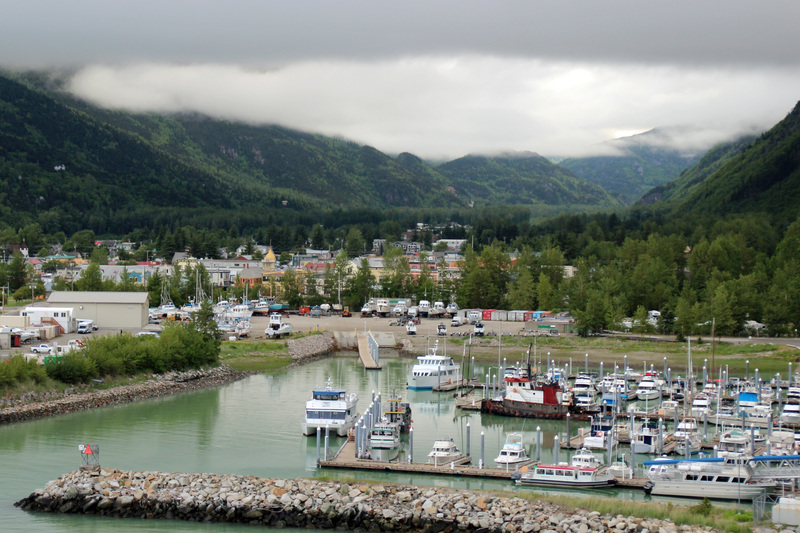 Arriving in Skagway, the rainy, cloudy weather began to clear and we could see the mountains that surrounded this gold rush town and the valley up the White Pass. 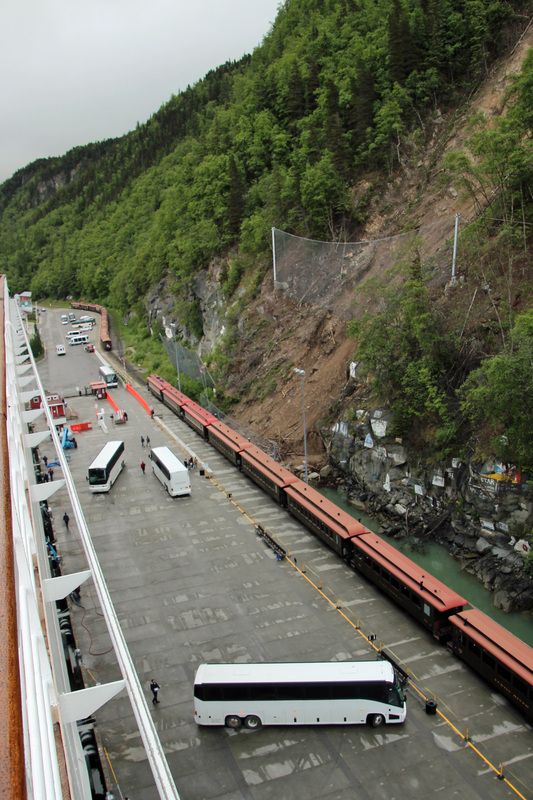 The rocky wall alongside the dock was painted with the names of ships that had visited this port and we could see the rail cars of the White Pass and Yukon Route narrow guage railway lined up alongside our ship. Jackie and I had tickets booked for this ride and Jeff and Vic were hoping their helicopter ride to glaciers was still going to happen that day. Our trip up the White Pass was great fun, as we climbed through the valley, across trestles and through tunnels, tracing the route of the Klondike gold rush stampede. We crossed into Canada and stopped at Fraser to have a look at the surrounding glacial tarn (lakes) and till (rocks). 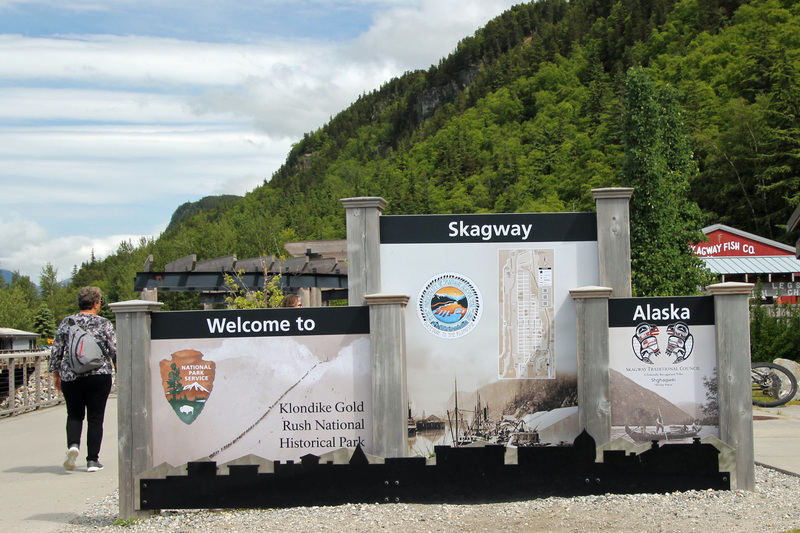 That’s also where we hopped a bus for the return trip back down to Skagway. We spent the rest of the day exploring town, one that retains its gold rush charm, and peeled off a layer as the day cleared and got rather warm. The Red Onion Saloon and brothel, Klondike Brewery, (Trail Coffee Blonde and Lost at Sea Coconut Brown Ale) and Skagway Brewing (Spruce Tip Ale and Blue Top Porter) were highlights. Klondike Brewery had just opened a month earlier and had some really good brews. When we met up with Jeff and Vicki back on board, they recounted how exciting their flight to the glacier was, with about 40 minutes spent on the glacier observing a moulin (vertical shaft with meltwater) and tasting glacial water. We had another great meal in the dining room a return visit to the martini bar and watched our departure for Icy Strait Point from the upper decks. The views as we pulled away from shore and down through the fjord were just breathtaking! 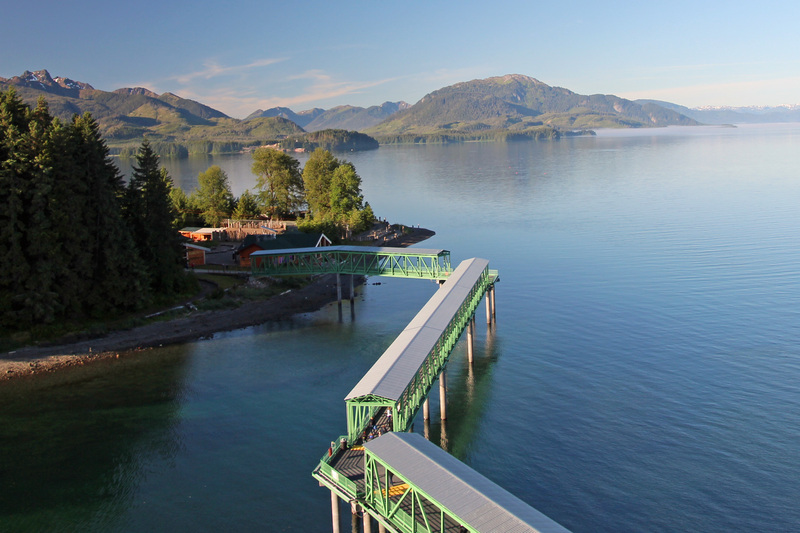 On day 5 we were headed to Hoonah, a small town that has an upgraded wharf and dock courtesy of the cruise line that is now rebranded as Icy Strait Point. 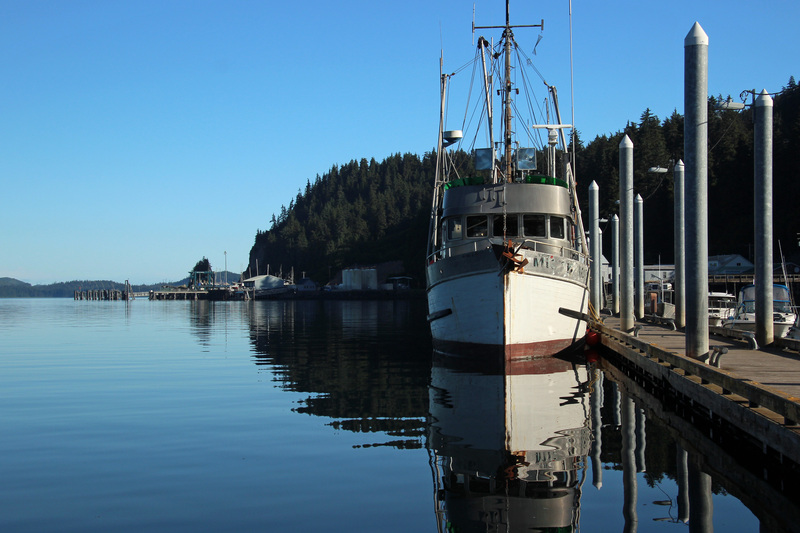 It is a wonderful spot to shop in the converted salmon cannery, try the long zipline, wander through old growth rainforest or catch a whale watching excursion. 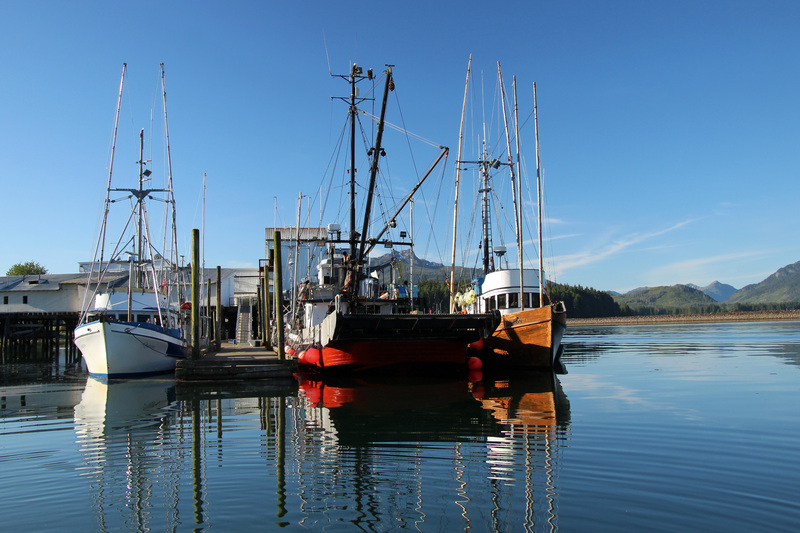 The whale watching is what Jackie and I were ready for as we motored out of the Hoonah marina on a beautiful, calm morning in a small boat. 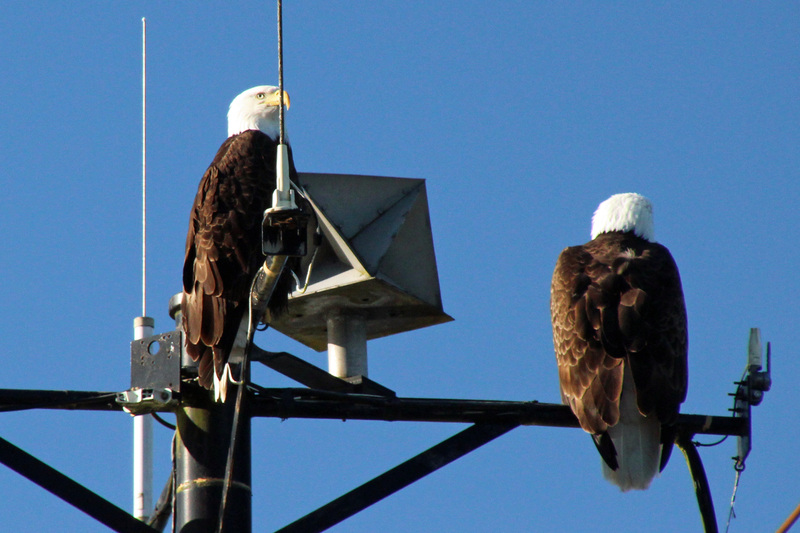 A pair of bald eagles watched us leave the dock as we sped off in search of humpbacks. The boat slowed as we passed patches of kelp and spotted a sea otter with youngster just feet from the boat. Look! 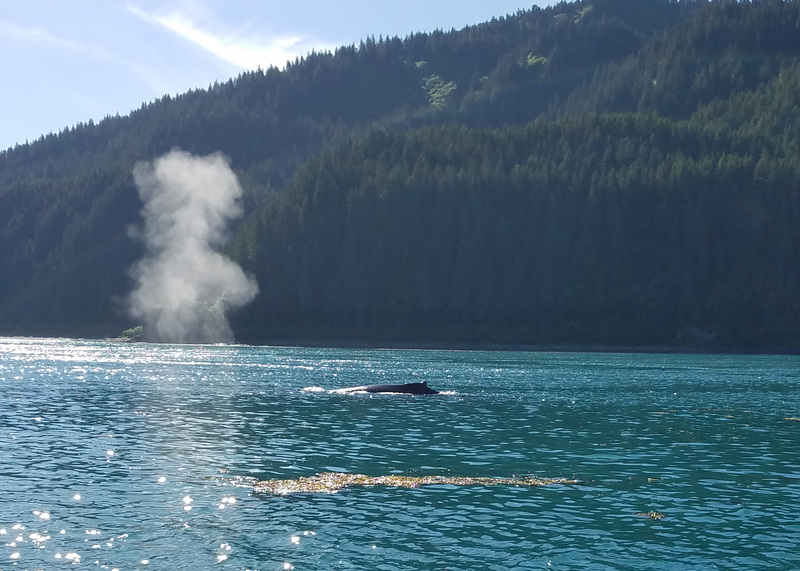 Over there, a whale blow (puff of steam) and we were in the midst of several humpbacks. We drifted about quietly as we listened to them surface, blow and then dive down, treating us to several views of tail flukes. Among them were porpoises bobbing up and down and then suddenly up ahead we had a full on breach of 15-20 feet of water and whale up out of the water. It went by so quickly that it was almost missed by most of us. Altogether we probably spotted a dozen humpbacks, plus a sea lion lounging on a channel marker. Another great day on the water. 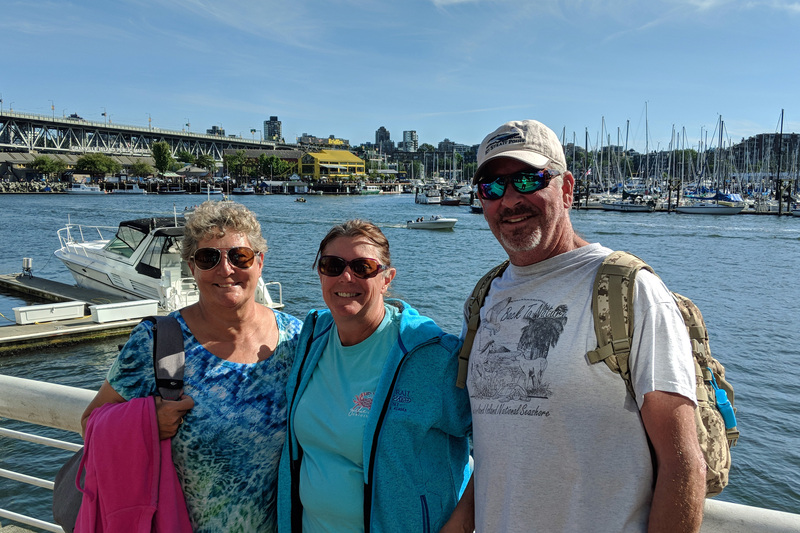 Once back on shore and walking around the old cannery, I lost Jackie but caught up with Jeff and Vicki. Jeff had done a toe dip in the water off shore and declared it cold. 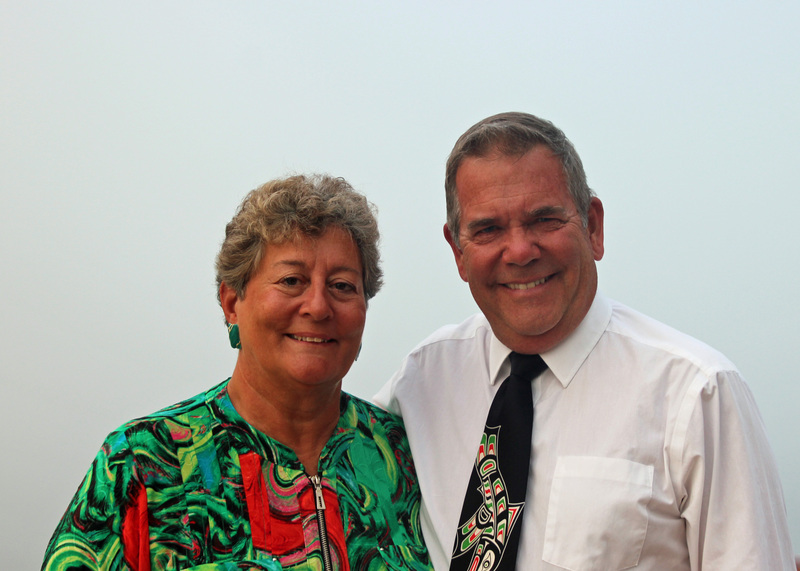 When we finally found Jackie she was in a panic about lost binoculars – did she leave them onboard the excursion boat? Shuttle van? Restroom? A bit of a scramble led to the lost and found desk at the excursions desk and luckily they had been found and turned in. Ok then, crisis averted. 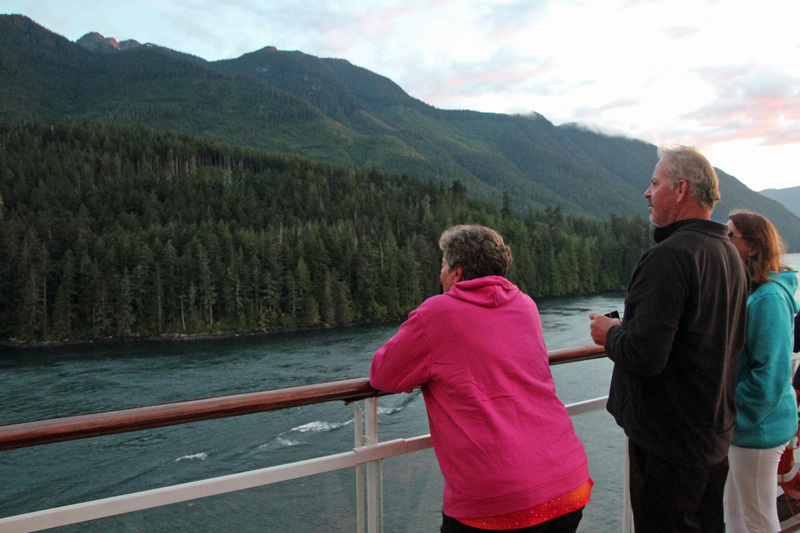 It was an early afternoon departure from Icy Strait, as we made room for another Celebrity cruise ship to dock. 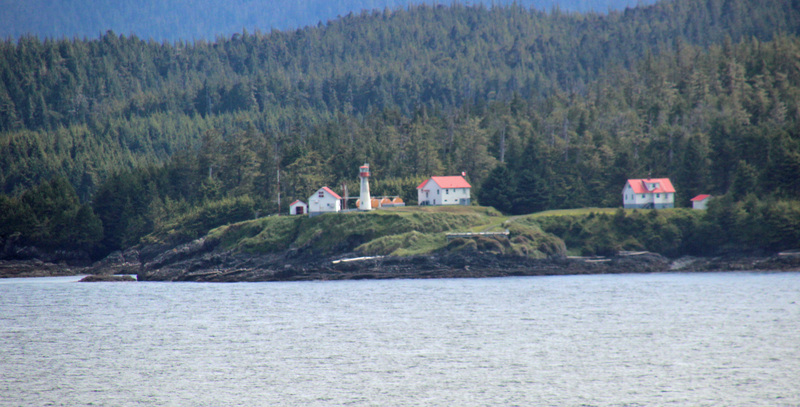 The sail away was another beautiful one as we scanned the water for more whales and the shorelines for bears. We were not disappointed, as we saw about 8 – 10 humpbacks cooperatively feeding in the distance, but only “rock bears” on shore. 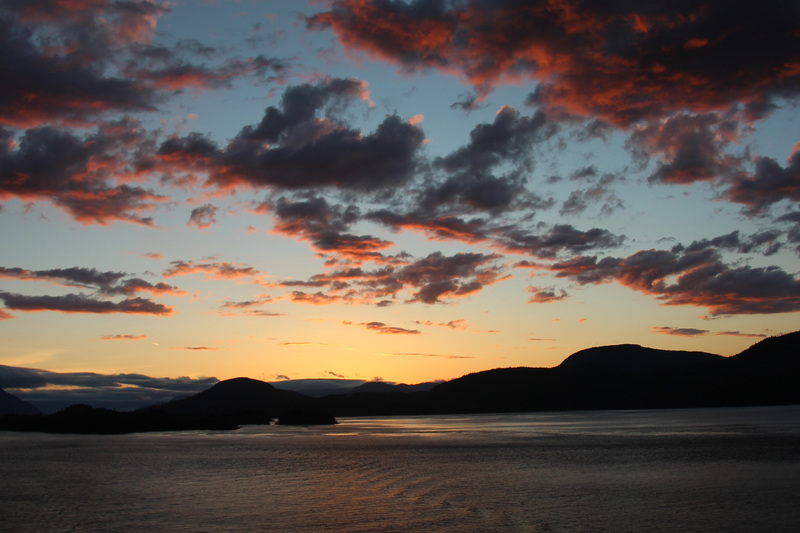 Ketchikan was our next port of call and the beautiful weather continued. Ketchikan is a busy port and we were joined by another cruise ship along the dock. 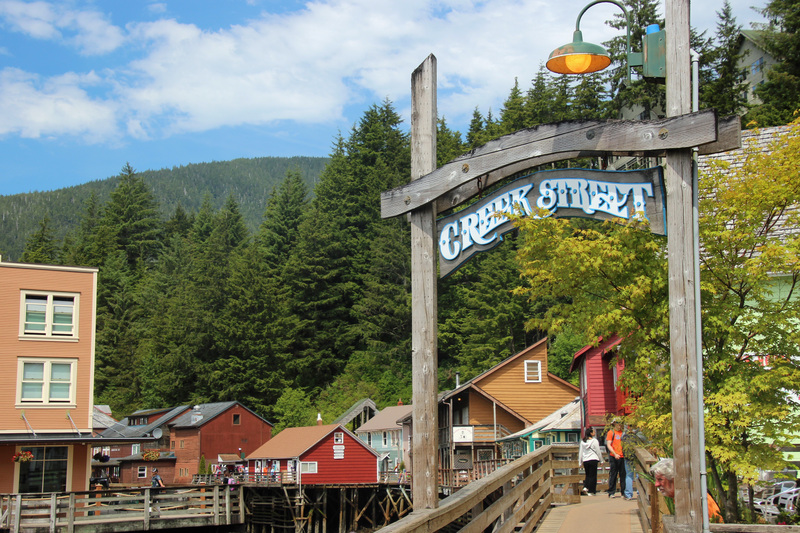 We were in search of totems in this town, plus a visit to Creek Street, home to many brothels that operated into the 1950’s. Each couple headed out to explore town and do some souvenir shopping. Jackie and I wandered up along the Creek Streets boardwalks, stopping a moment to read about Dolly’s Place and several of the business women of the area. Salmon are an important part of the local economy and the upper area of the Ketchikan Creek had a cool salmon ladder that bypassed the waterfall. 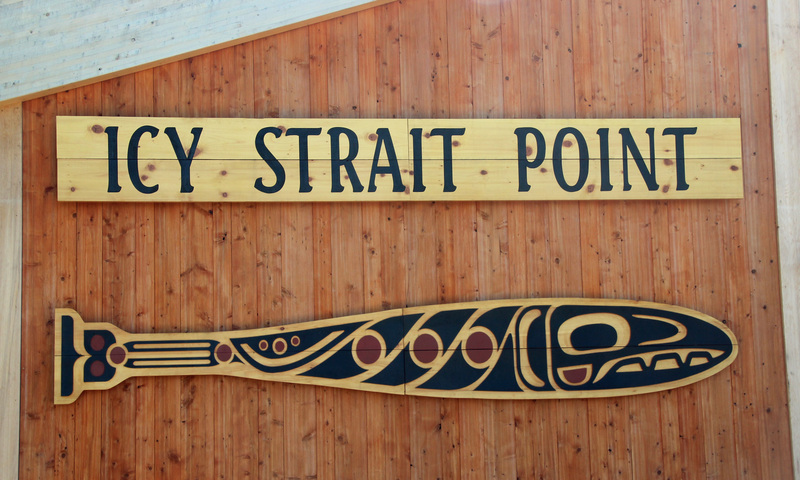 We stopped in at the Totem Heritage Center to learn more about the story poles. 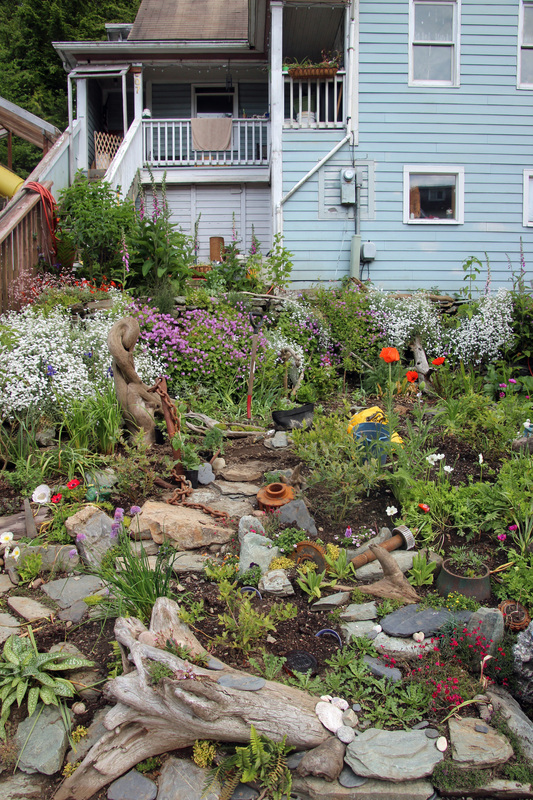 On our walk back to the wharf we passed a cute cottage with an artfully designed rock and container garden. We met the owner, Cora, and had a good conversation about gardens and the challenges of keeping deer and slugs away from the plants. It seems deer are one critter we have in common. I told her about my glass totem hobby and suggested she consider trying her hand at the glass sculptures. (I later read her nice comment on the blog). As we crossed the Ketchikan Creek there was a bit of commotion. 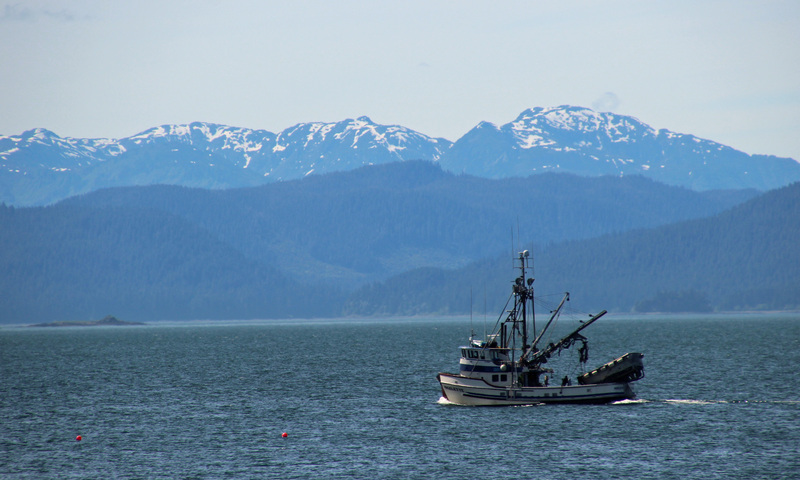 We noticed a fisherman on the bridge had a salmon hooked with a pretty light spinning rig and was trying to keep him hooked while moving off the bridge and down the rocky shore – in sandals. We got to see the big fish as he wrestled him ashore and we were pretty certain he would have to hurry before an eagle snatched it up. 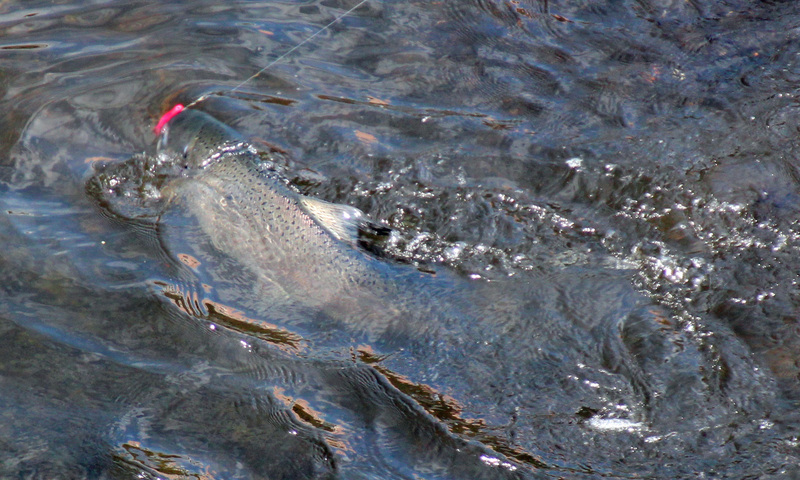 But he walked off with his trophy – a darn nice catch! 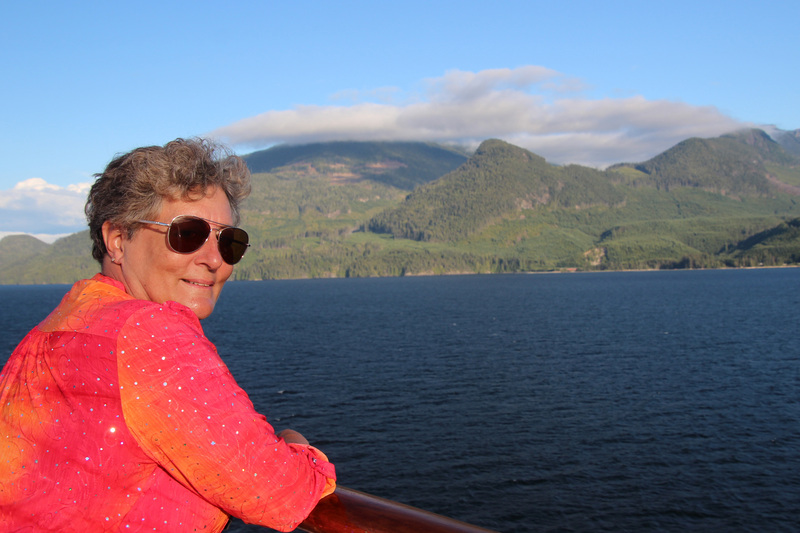 The day at sea through the Inside Passage was next, as we sailed into Canadian waters surrounded by green mountains in our narrowest fjord. It was such a nice day that much of the time was spent around the pool deck as we continued to scour the water and hillsides for wildlife. We spotted some whales blowing in the distance and saw a few porpoise in our wake. 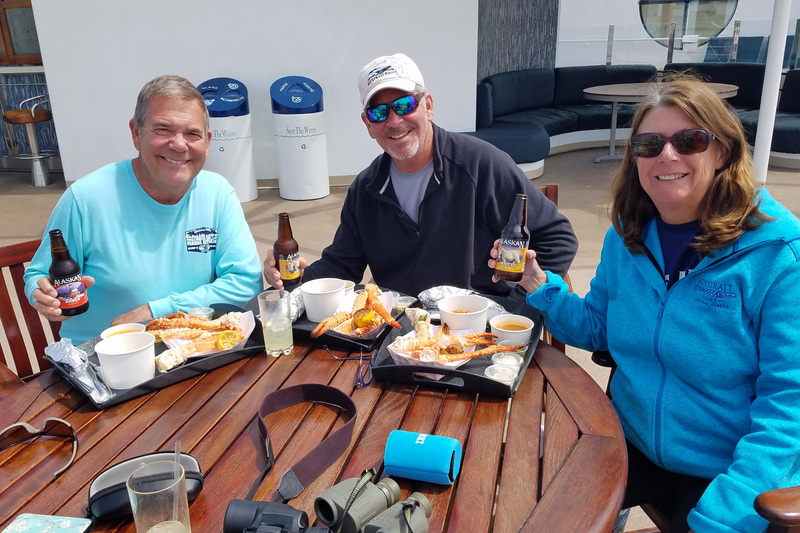 The poolside grill featured an Alaska Crab platter for the second time, so we cracked into three big Alaskan crab legs, two crab cakes, crab bisque and a garlic roll — of course accompanied by our onboard favorite Alaskan White Ale. It was also Jackie’s birthday, so we made a fuss at dinner as she blew out the candle on her cake. The evening was delightful on the upper deck as we watched the sun actually set later that night. 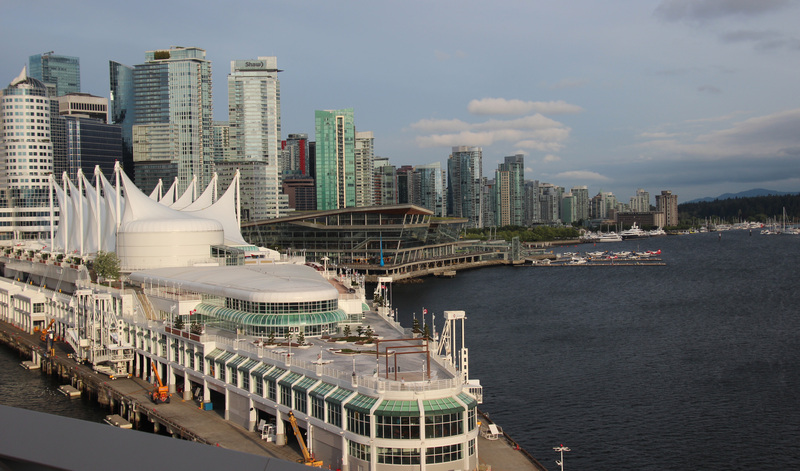 What a great last evening aboard as we approached our final port in Vancouver. (Well, it was still a scramble as we packed our bags for departure that night). Next morning I was up early to watch our approach into Vancouver harbor. Quite the contrast from the small Alaskan towns we had visited. The port was busy with ferries, helicopters, seaplanes and many tankers in the harbor waiting their turn. After breakfast we watched the load-in of fresh vegetables and fruits as we awaited our call to depart the ship. Changeover days are definitely bittersweet – you head off as a new group gets ready to board and receive their welcome champagne. Was it really only last week that we had ours? We caught a taxi to our Best Western Sands hotel in the West End, zipping through downtown skyscrapers, midtown neighborhoods and eventually a block from the seawall. 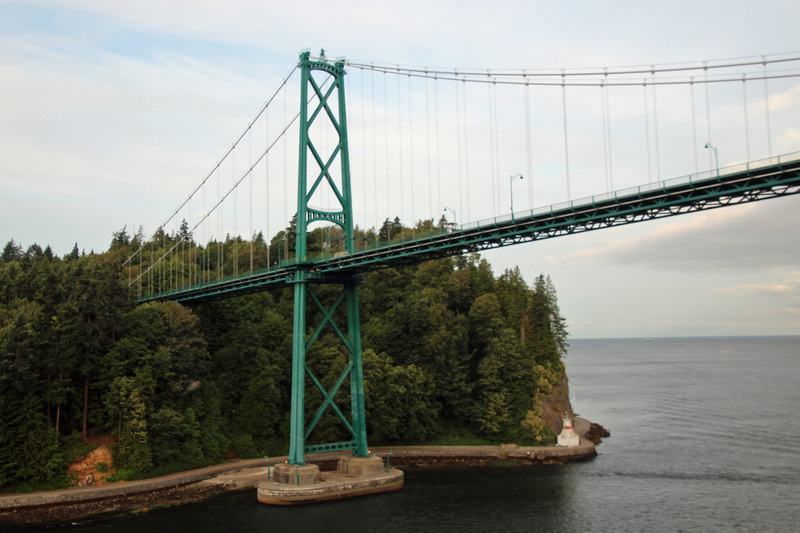 We checked our bags and hiked off in search of rental bikes to ride around nearby Stanley Park. We couldn’t really decide once we got to the rental spot and thought we were hungry, so we made our way past so many different eateries, though most were not open. Indecision led us back to our hotel and the restaurant next door, The Park Pub, where we ate another breakfast (it was barely 11 am). 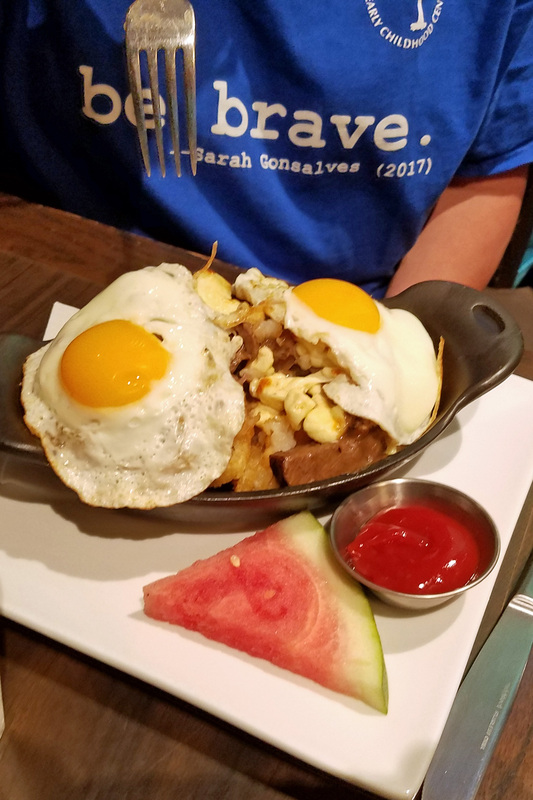 This one was deliciously hearty: Vic had poutine (potatoes, eggs, cheese), Jeff had a version of steak and eggs, I had oatmeal with fruit and Jackie had fruit with yogurt. We were able to check in to our room, so up we went and promptly all crashed on the beds. Two hours later we were up and much refreshed. So of course we had to go explore. It was a fair day along the seawall, so we walked and people-watched and discussed plans for the next day. Our flight didn’t leave until 10:30pm, so we had another whole day in town. 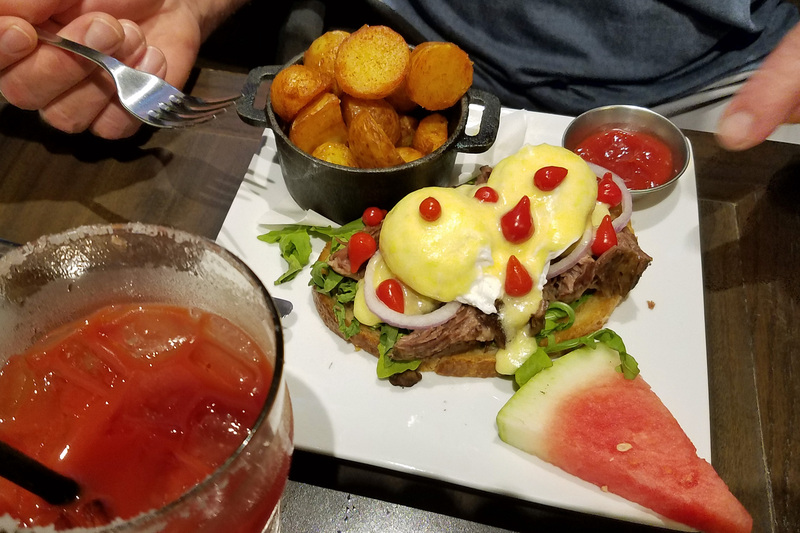 The conversation and indecision about places to eat continued until dinner, until we found out that our hotel restaurant had $4 hamburgers for happy hour. Decision made! And it was a good one. 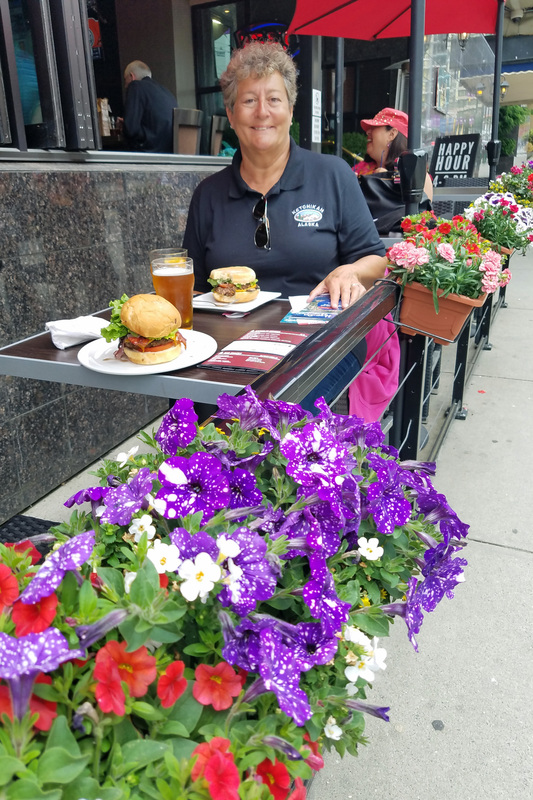 We had burgers piled high, more fries than we could eat and cold beer to drink as we sat along the sidewalk and enjoyed the evening. When we met up at TapShack on the waterfront under Burrard Bridge we had a delicious meal of fish tacos, yummy fresh salad, chips and salsa. Of course local beer selections, too. Probably the best beer of the trip for me was a mandarin radler. Jeff liked the Hoyne Brewing Dark Matter, a Guiness style ale. Back to the hotel, catch the cab, head through security and out to the gate to await the flight home. Just over four hours later and we were dragging our bags to customs and a very confusing checkpoint then back home to hot and humid Atlanta weather. Another crash on the bed and visions of whales in our heads. What an adventure! Where are we off to next? Well, we still have a few minor fixes for the motorhome before we head out in September for fall leaf spotting in the northeast and Maine. Plus, we will be watching our nephew Adam’s progress up the Appalachian Trail to see if we will meet him there in October. Otherwise … who knows what adventures lie ahead? 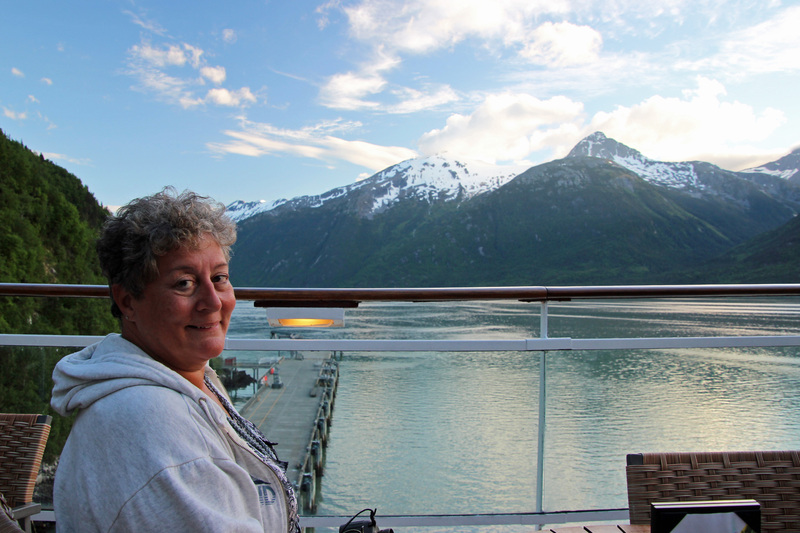 By the way, if you are planning a cruise, give our travel agent Cynthia Long (617-587-6000 x 38584) at CruisesOnly a call. She was a great help booking the trip and getting us some onboard credits and extras. Mention us and we can earn points.